Newport Beach, CA (April 6, 2019) – Finishing three days of very close competition in Newport Beach champagne conditions, Newport Harbor Yacht Club’s Team Lightning took first place in the 2019 Baldwin Cup Team Race (BCTR). Larchmont Yacht Club finished second. The championship sail-off between Larchmont Yacht Club and Newport Harbor Yacht Club Team Lightning today capped off day that started in six knots of breezing building to 12 knots out of the west. Team Lightning beat Larchmont Harbor Yacht Club three zero in the finals. It was a triumphant first-time win for Team Lightning sailor Caleb Silby who long sailed for various NHYC teams. He somersaulted into the bay celebrate. 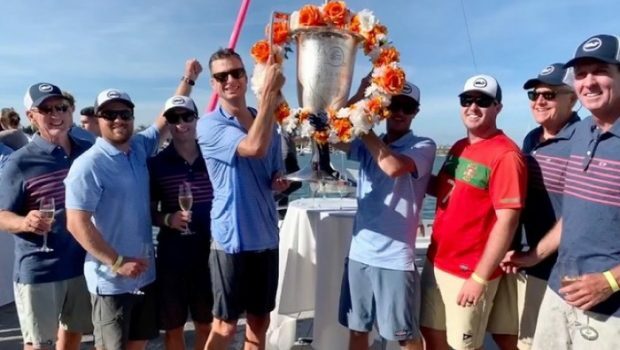 This year’s Baldwin Cup Team Race saw: old adversaries with winners often being determined in the last 10 feet of the race and the best stadium style racing in front of the new clubhouse just off the dock with over 300 spectators. “We couldn’t have asked for more perfect weather,” said Staff Commodore Jeff Gordon and regatta chairman. “We could not do this regatta without the support of our sponsors, JPMorgan Chase supporting this event for six years, Goslings Rum, and, new this year, Dry Creek Vineyard. Racing was held April 4-6.